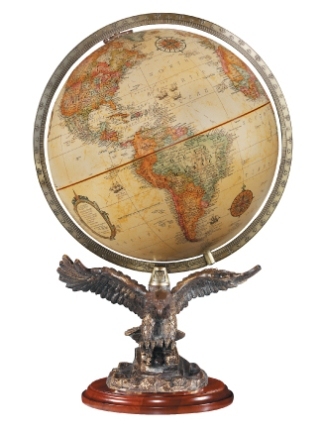 Replogle's Freedom Desk Globe sits atop a bronze resin eagle with beautiful gold details. The sculpture is anchored by a cherry wood base. A full meridian features latitudinal markings and traditional details. Warm hued land masses and off-white oceans are enhanced with an antique finish. The Freedom Desk Globe is backed by a one-year warranty.